Devil in the Hole is based on a true crime that occurred over 40 years ago in New Jersey, wherein a man murdered his entire family, wife, three children, mother and the family dog, and disappeared. My novel uses that event and takes off from there, following the murderer on his escape route. Using the voices of people he meets along the way, and people who are affected by his crime, the reader starts to build a portrait of the man and why he did what he did, in addition to following those who are searching for him. I am quite familiar with this story (although it’s not a true account), as I live in Philadelphia. So, the “believability” factor was certainly not a problem for me. 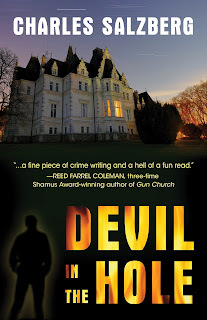 Devil in the Hole is a quick read…partially because of its format (short, easy-to-read chapters that are told from a different person’s perspective), its fast pace, and its compelling storytelling. I read this book in one night — albeit, it was a late night — because I simply could not put it down. It’s that compelling. And that gripping. Salzberg has a way of seamlessly flowing from one voice to the next (not an easy task, either) and does so realistically and believably. I find myself staying up late to read on more occasions than I’d like to admit…but to not put a book down until it’s finished? That’s saying something about Devil in the Hole. If you’re a fan of crime stories, suspense, thrillers, whodunnits, or anything along those lines, you will enjoy this book. I have not a single complaint or criticism; it’s simply that good. Unimpeachable, actually. Devil in the Hole is one of those books that can (and likely will) put its author on your radar for future reading material. I know it did for me. James KirklandI knew something was out of whack, only I couldn’t quite put my finger on it. Just something, you know. And it wasn’t only that I hadn’t seen any of them for some time. I mean, they’d been living there for what, three, three and a half years, and I don’t think I ever had more than a two- or three-minute conversation with any of them. And God knows, it wasn’t as if I didn’t try. All things considered, they were pretty good neighbors. Mostly, I guess, because they kept to themselves. Which is certainly better than having neighbors who are always minding your business, or who don’t mow their lawn, or who drop in uninvited, or who throw wild parties and play loud music all night long. They weren’t like that. Just the opposite, in fact. Why, with that great big front lawn and two teenage boys you’d think they’d be out there tossing a football or a Frisbee around, or something. But no. It was so quiet sometimes it was as if no one lived there at all. Though I did hear rumors that the boys had a reputation of being hell-raisers. Maybe that’s why they kept such a tight lid on them when they were home. Because I can honestly say there wasn’t any hell-raising going on in that house that I could see. As a matter of fact, the only way you’d know the house was occupied was when you’d see the kids going to school, or him going off to work, or her and the mother going out to shop. Or at night, when the lights were on. Which brings me back to the house itself. And those lights. It was the middle of November, a week or so before Thanksgiving, when I first noticed it. I was coming home from work and when I glanced over there I noticed the place was lit up like a Christmas tree. It’s a Georgian-style mansion, one of the nicest in the neighborhood, by the way, with something like twenty rooms, and I think the lights were on in every single one of them. But the downstairs shades were drawn tight, so all you could see was the faint outline of light around the edges of the windows, which gave it this really eerie look. Maybe they’ve got people over, was my first thought. But that would have been so out of character because in all the time they’d lived there I’d never seen anyone go in or out other than them. And anyway, it was absolutely quiet and there were no cars in the driveway or parked out on the street. Just before I turned in, I looked out the window and noticed the house was still lit up, which was odd, since it was nearly midnight and, as a rule, they seemed to turn in kind of early over there. The next night when I came home from work and I looked across the street the lights were still on. And that night, before I went to bed, after midnight, I looked out and the lights were still blazing. After that, I made a kind of game of it. Under the pretense of getting some fresh air, I walked close to the house, as close as I could get without looking conspicuous, and listened to see if there were any sounds coming from inside. A couple of times, when I thought I heard something, I stopped to listen more carefully. But I never picked up anything that might indicate that someone was inside. And each night, when I came home from work, I made it a point to check out the house and make a note of how many lights were still burning and in which windows. I even began to search for silhouettes, shadows, anything I might interpret as a sign of life. And it wasn’t long before I whipped out the old binoculars to take a look, thinking maybe I could see something, anything, that would give me a hint as to what was going on. But when my wife accused me of being a peeping Tom, I put them away, at least while she was around. There weren’t always the same number of rooms lit, but I noticed there were always fewer, never more. It was as if someone was going around that house each day turning off one light in one room, but in no discernible pattern. I began to think of that damn house during the day, while I was at work, or on the train coming home. It became a real thing with me. I even kept a notebook with a sketch of the house and notations next to each window that had a light on. At night, I played a game. I began to think of that house as my own personal shooting gallery and, sitting on the window sill in my pajamas, while my wife was either in the bathroom or asleep, I’d choose one of the rooms and aim my imaginary rifle and pop! pop!, I’d shoot out one of the light bulbs. And, if the next night that particular room was dark, I’d get a tremendous rush of self-satisfaction that carried me through the whole next day. It was kind of like one of those video games my kids play. Pretty sick, huh? I mentioned it to my wife—not my silly game, but the fact that those lights were going out one by one. She thought I was nuts. “Can’t you find anything better to do with your time?” she asked. “No,” I said. “I’m entertaining myself. Leave me alone.” Then I asked whether she’d seen the Hartmans lately, because I was beginning to have this weird feeling in the pit of my stomach, as if something was seriously wrong. That it wasn’t a game anymore. “Go to bed,” she said. So I did, lulling myself to sleep with my imaginary rifle cradled in my arms, as if it would actually afford me some protection just in case something was wrong. A few nights later, I set the alarm for three-thirty and slipped the clock under my pillow. When the vibration woke me, I got up quietly, so as not to wake my wife, looked out the window and sure enough the same number of lights was burning in the house as the night before. I was puzzled and frustrated because I was dying to know what was going on. I even thought of making up some kind of lame excuse to ring the Hartmans’ bell. But I didn’t have the nerve. Two weeks later, only three rooms in the house were still lit. Down from eight the week before, fourteen the week before that, the week I began to keep count. I asked my son, David, whether he’d seen the Hartman kid in school, the one in his class. I went back up to my room and stared out the window for maybe fifteen minutes, trying to figure out what the hell was going on. I wondered if I should do something. “Come to bed,” my wife said. So, that’s how I called the cops. Charles Salzberg is a freelance writer whose work has appeared in Esquire, New York magazine, Elle, Good Housekeeping, The New York Times Book Review, The New York Times, GQ and other periodicals. He is the author of more than 20 non-fiction books and several novels, including Swann’s Last Song, which was nominated for a Shamus Award for Best First PI Novel, and the sequel, Swann Dives In. Salzberg also has taught been a visiting professor of Magazine at the S.I. Newhouse School of Public Communications, and taught writing at Sarah Lawrence College, the Writer’s Voice, and the New York Writers Workshop, of which he is a founding member. I have this book in my TBR pile and after reading your review, I just moved it closer to the top. Awesome review. Thank you. Thanks for the review! Love adding books to my “to read” list! ohh i love crime stories! i wanna read this.. This certainly made huge headlines when they captured him. I’ve yet to read the book and thank you for your review. It’s on my TRL. now. Ooh! Now this looks like a good read!